The fitness industry is as crowded as it’s ever been, but with over 54,000,000 Americans utilizing paid gym memberships each and every year, there’s room for growth. Between 2008 and 2014, new memberships grew almost 20%! Is your gym or fitness business going about marketing the right way? Whether you’re struggling to gain traction in a new market or simply want to incentivize customer loyalty, you’ve got options. Here are four fitness marketing techniques you may not have considered. Contact new residents while they’re still new. Direct mail works well, but it works best when it’s targeted. Partnering with a direct mail company that utilizes targeted lists of new community residents is a worthwhile investment, as is working with relocation specialists in the area to tap into the new resident market. Apartment complexes, realtors, and even extended-stay hotels are all good resources for clientele that are new to the area. Statistics show that the majority of all gym users go to a facility less than 10 miles from home. People are used to being advertised to, particularly millennials. To prevent your direct marketing from becoming lost in the mailbox, take steps to personalize your message. 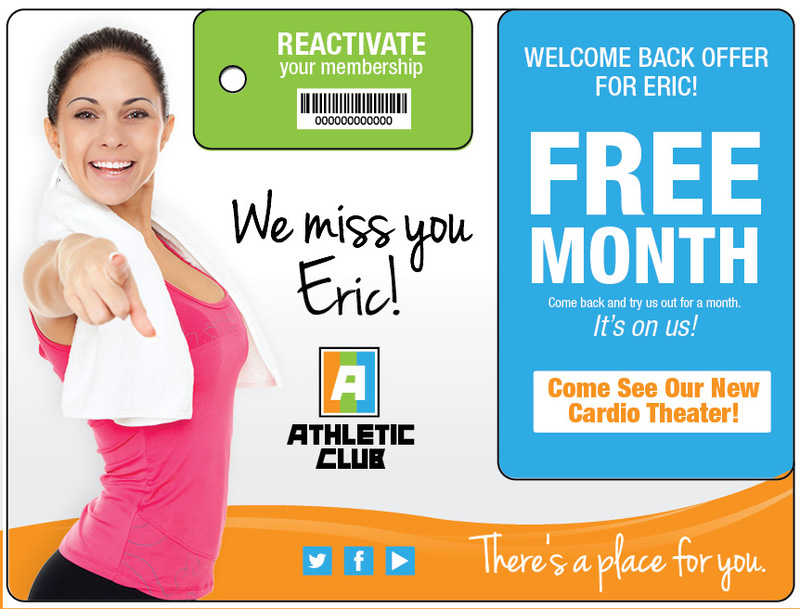 For example, when remarketing to former members, utilize variable data printing to include a message and offer directed specifically to them by name (“We miss you Alex!”) as an incentive to return to your club. Throw in a free gift or a special rate and you’ll increase your customer retention rate in no time. Your best untapped marketing resource is the people already using your gym. This is particularly true in the era of community-minded fitness centers whose members self-identify with the fitness brand. Giving current members barcode-equipped referral cards that provide new users a free month is a great way to get the word out; rewarding those referrers with a free month on their own membership boosts retention and further motivates continued referrals. Cross-promote with other local businesses. Bar code technology is probably more wide-ranging than you might think. For example, it may be possible to implement a system in which your gym members can use their bar code equipped membership card for discounts at other businesses: smoothie shops, athleisure clothing stores, or even healthy restaurants. Tie that data back into your in-house POS/check-in system to reward members for making healthy choices by offering free personal training sessions or monthly dues. Let your technology work for you, not the other way around. Fitness marketing is changing as fast as the concept of the gym itself. � Impact Mailers is a full service direct mail marketer with extensive experience in the fitness industry. From boutique studios to multi-unit gyms, our team knows what it takes to grow your membership with attention getting direct mail.� Give our experienced team a call today at 404-973-2770 to get started on your own fitness marketing plan.